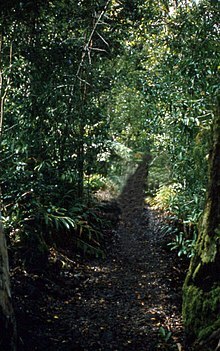 The park is about 11 miles (18 km) north from Hilo, west of Honomū off the Hawaii Belt Road (route 19) at the end of Hawaii Route 220. 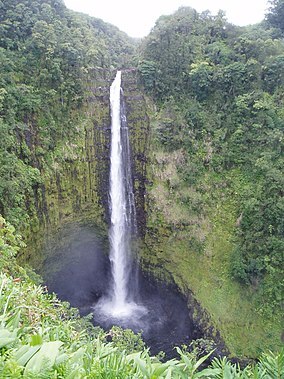 It includes ʻAkaka Falls, a 442 feet (135 m) tall waterfall. 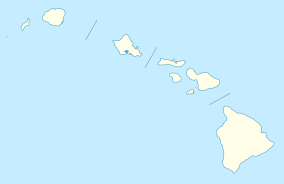 ʻAkaka in the Hawaiian language means "A rent, split, chink, separation; to crack, split, scale". The accessible portion of the park lies high on the right shoulder of the deep gorge into which the waterfall plunges, and the falls can be viewed from several points along a loop trail through the park. Also visible from this trail is Kahūnā Falls, a 300 feet (91 m) tall waterfall, and several smaller cascades. The ʻoʻopu ʻalamoʻo is an endemic Hawaiian species of goby fish that spawns in stream above the waterfall, but matures in the sea. These fish have a suction disk on their bellies that allows them to cling to the wet rocks behind and adjacent to the waterfall. Using this disk, they climb back up to the stream when it is time to spawn. A shrimp called the ʻōpaekalaʻole has also evolved to climb ʻAkaka Falls and live in Kolekole Stream. ^ "'Akaka Falls Loop Trail in 'Akaka Falls State Park". hikespeak.com. hikespeak. Retrieved December 9, 2018. ^ "'Akaka Falls Loop Trail in 'Akaka Falls State Park". hikespeak.com. Hikespeak. Retrieved December 14, 2018. This page was last edited on 15 December 2018, at 06:38 (UTC).